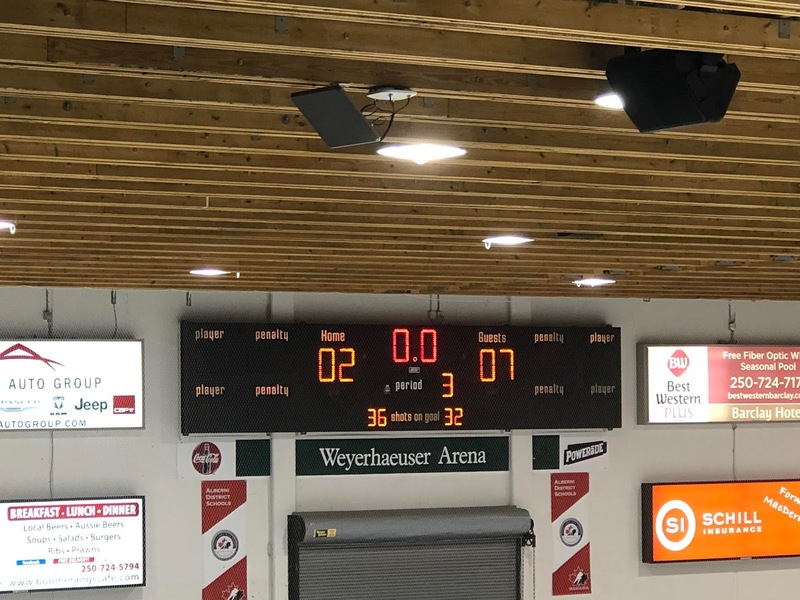 The Bulldogs got off to a great start, getting a series of chances on the opening shifts and forcing the Grizzlies into an icing to keep the pressure on. Matt Dumba made two good saves on deflections to keep it scoreless. He would made another fantastic save on Ryan Moon all alone in tight, appearing to just get the shaft of his stick on it to deflect it out of play. The Grizzlies pushed back on a good attacking zone shift near the middle of the period, with John Hawthorne making two solid saves in tight on Alex Cambell with both pads. The teams traded chances back and forth through the next few minutes, with tempers flaring late in period when Mitchel Deelstra took a hit from Ryan Nolan at the lip of the Grizzlies crease, but stood his ground as Nolan bounced off and onto his own goalie. Deelstra would fall backwards, and then be immediately jumped and repeatedly pummeled by Carter Berger, who went over the line in my opinion, and also in the opinion of the Referees with one last vicious punch while he was defenseless on his back. Berger would get the game with a blow to the head minor, and double misconducts. The Grizzlies took a bench minor before the puck drop, resulting in a full two minute 5 on 3 for the Bulldogs. They would push on it, but couldn't beat Dumba or the Grizzlies penalty killers as it stayed scoreless. A minute later, it was 1-0 when Stephen Castagna found a Ryan Moon rim behind the Grizzlies net and left it for Mackenzie Wight. He would walk out into the left circle where he beat Dumba short-side to make it 1-0 at 19:19 of the first. At the buzzer, a srcum broke out that saw Henri Schreifels take a shot at Marcus Walter, who returned a punch in retaliation, as he would receive the only penalty. Shots in the period were 14-10 Bulldogs. The Bulldogs quickly struck while shorthanded to open the period, as Grayson Valente made a composed play to bank the puck up the right wing. Stephen Castagna also might have gotten a piece of it, as it came to the middle of the line where Dawson Tritt raced away on a breakaway that he finished top corner, far-side over the glove of Dumba to make it 2-0 at 29 seconds of the period. Seconds later, the Bulldogs were again penalized, putting Victoria onto a 5 on 3 power play that the Bulldogs effectively killed off with a handful of blocks and sticks in passing lanes. The Grizzlies would get on the board on the second penalty however, as Cameron Thompson put a wrister on net from the left circle that beat a screened Hawthorne short-side to make it 2-1, with assists to Nico Somerville and Ryan Nolan at 2:14 of the second. It was a 2-2 game two minutes later when the Bulldogs got caught in the Grizzlies zone and gave up an odd man rush that saw a pretty passing play be finished off by Alex Newhook at the top of the crease, with assists going to Alex Campbell and Darwin Lakoduk at 4:26 of the period. The Dogs were penalized two minutes later, but again successfully killed it off. Mitchel Deelstra would exit the box and race in alone on a breakaway but couldn't get a shot on target to test Dumba as it remained tied. The teams traded chances until the late stages of the period, when the Grizzlies scored again on the rush, on a pass picked up by Ryan Nolan across the Bulldog line that was close to offside - to skate in alone on Hawthorne where he beat him high short-side to make it 3-2, with assists to Cameron Thompson and Nico Somerville at 16:16 of the second. The Grizzlies would push hard for the next two minutes, but the Bulldogs held on with Hawthorne making a couple good saves to keep it a one-goal game after 40 minutes. Shots in the period were 10-7 Bulldogs, for a 40 minute total in their favour of 24-17. The Grizzlies killed off a short Bulldog power play to start the third, before immediately going to a four minute power play of their own that they cashed in on just 28 seconds into it on a cross-ice set up by Riley Hughes that was one-timed home from the right side of the slot by Alex Newhook for his second of the game. Also assisting on it was Jeremie Bucheler at 1:30 of the third to make it 4-2. Hawthorne made a couple saves on the second penalty to keep it a two-goal game, before Mackenzie Wight raced in on a breakaway but couldn't get a shot on goal on a stick on stick from behind as it stayed a two-goal game. The Bulldogs weren't able to generate a push to get back in it before the Grizzlies padded their lead, going up 5-2 8:14 into the period as Marty Westhaver was allowed to walk into the Dogs zone, and right through the defence up the middle where he beat Hawthorne seven-hole. Assists on the play went to Henri Schreifels and Jarin Sutton. The score stayed that way until the late stages of the game, with Cameron Thompson somewhat similarly to the Westhaver goal being allowed to walk from centre into the Dogs zone into the right circle untouched where he snapped one home top corner, far-side over the blocker of Hawthorne to make it 6-2 at 16:19 of the third. Some final salt in the wound came in the final minute, as Alex Newhook completed the hat trick, again similar to the previous goal as he accepted a pass and walked into the right circle and past a forward playing defence to pick the top corner, far-side past the blocker of Hawthorne to complete the scoring with Alex Campbell drawing the assist at 19:20. Third period shots were 15-12 Grizzlies, for a game total of 36-32 Bulldogs with John Hawthorne taking the loss while Kyle Dumba earned the win. The Bulldogs went 0 for 3 on the power play, while also scoring once while shorthanded. The Grizzlies went 2 for 5. The Bulldogs are next in action Friday night in Powell River.